My wife and younger children are going to Ireland tomorrow to the place in Westmeath where my late father-in-law lived. My older children too will be elsewhere over half term. I, meanwhile, will be paying another visit to my parents and the house where I grew up. Going away from one home, returning to another: that's what brought this excerpt to mind. "Inside, there was the mossy brown smell he'd been raised with, that seemed to be part and parcel of the house and was a wonderful smell if you were glad to be home and an unbearable smell if you were not. And mingled with it were the more temporary, tangible smells - bacon, coffee, hot radiators, newly ironed dresses, bath powder. He was standing in the narrow hallway and looking into the the living room, which was stuffed with durable old ugly furniture that had stood the growing up of seven children. On the walls hung staid oil paintings of ships at sea and summer landscapes. The coffee tables were littered with things that had been there as long as Ben Joe could remember - little china figurines, enamelled flower pots, conch shells. Periodically, his mother tried to move them, but Gram always put them back again. On the floor was an interrupted Monopoly game, a pair of fluffy slippers, a beer can and a pink baby sweater that reminded him of Tessie. It must belong to Joanne's baby now. He set down the suitcase and the newspaper and crossed into the living room to pick the sweater up between two fingers. It seemed to him that every girl in the family had worn that. But had it really been that tiny? Ben Joe smiled and headed through the hallway toward the voices, with the sweater still in one hand. At the open doorway to the kitchen he stopped and looked in at the five girls sitting around the table. 'Anybody home?' he asked. They all turned at the same moment to look at him, and then their chairs were scraped back and five cheeks were pressed briefly to his and questions hurled around his head. He stood smiling, unable to get a word in edgewise. They were circled around him, looking soft and happy in their pastel bathrobes, and if they had been still a minute he would have said he was glad to see them, even if it would embarrass them, but they didn't give him a chance. Lisa reached for the baby sweater in his hand and held it up over her head for others to laugh at. 'I forgot about her being named Carol,' Ben Joe said. 'One more girl to remember. Hoo boy.' He took off his jacket and turned to hang it on the back of his chair." 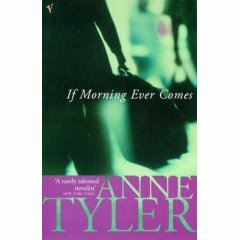 From If Morning Ever Comes, by Anne Tyler.